This one is pretty self explanatory, but I was really hapoy with the way it turned out. I’ve always been fascinated by Elvish writing. J.R.R. Tolkien created an amazing world, full of amazing cultures. The details are amazing. I love the fact that he created a complete language for the Elves. There is actually a class in an English college that teaches it. How amazing would that be? The writing is beautiful too. 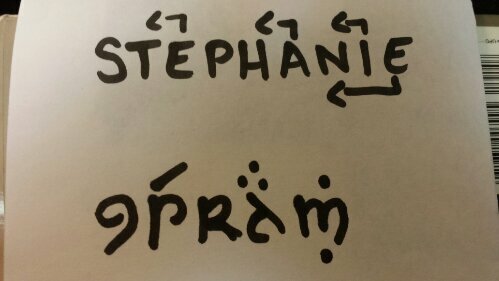 I’ve been toying with the idea of an Elvish tattoo for awhile, just haven’t gotten there yet. Then I stumbled across this pin that teaches you the very basics of writing in Elvish. Obviously there will be exceptions to these basic rules, but the basic steps are as follows. It will make everything easier if you print your name to start. You guys know me as Stevie, which is short for Stephanie, but Stephanie just turned out better. The consonants remain as is. When you get to a vowel, the vowel will move up and to the left, so it ends up above the previous letter. Special rules are explained on the original site. For instance, you’ll notice the silent ‘e’ at the end of my name ends up below the ‘n’ while the ‘I’ goes above. There are special letter combinations, that may exist in your name, and they have their own symbols. Definitely check out the full site for more detailed rules and the full alphabet. I know I’ll be going back to do my kids’ names at the very least!